This is a photo of a fine specimen we grew in 2009. Last year we had no onions at all. All the onions (Ailsa Craig) and shallots (saved successfully for many years) went rotten and soggy. We put it down to the very cold and wet summer. We had plenty of leeks though. In previous years we'd had a really good harvest which kept us in onions all year. They kept really well hanging on strings in the (unheated) conservatory. This nasty beastie seems to be a new migrant to our shores and we in the East Midlands are particularly suffering. 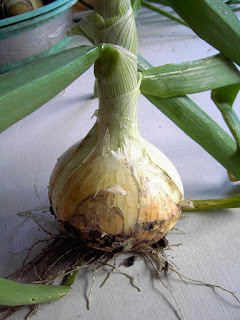 The rotten onions last year were probably a result of infection following the damage by the flies. So all the leeks got burnt. We've made the decision not to grow leeks next year, but we'll try growing onions in a different spot and under cover when we first plant them out in May. With a bit of luck we'll harvest early before the second egg-laying season.